(Destin, Fla.) February 26, 2018 –Over 150 guests attended Shelter House’s 2nd Annual Palate & Palette Five-Course Wine Dinner and Live Painting on Saturday, January 27, 2018, at the Legendary Marine showroom in Destin. All proceeds for this event went directly to Shelter House, the state-certified domestic and sexual violence center that has been serving both Okaloosa and Walton counties for over 30 years. 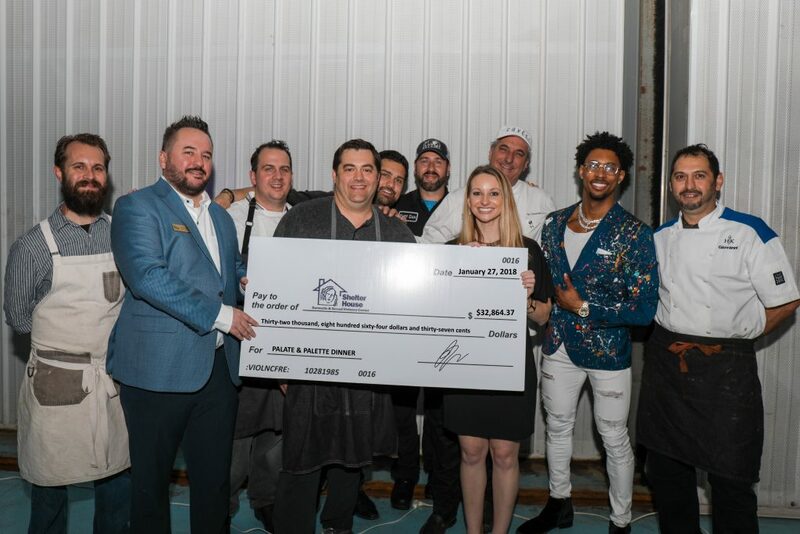 Palate & Palette, which raised almost $17,000 in 2017, raised upwards of $33,800 this year, making this Shelter House’s most profitable fundraising event since the organization’s inception in 1985. Each of the chef’s unique courses was perfectly paired with hand selected wines by Republic National Distributing Company, Southern Wine and Spirits and Krutz Family Winery of Sonoma County, California. Select food and ingredients for each of the dishes were graciously donated by Whole Foods in Destin. Local beverage companies Timber Creek Distillery and Grayton Beer Company served craft cocktails and beers all night. The event featured an expansive silent auction, which featured trips, dining experiences, gift cards, wine by local artists and more. B-Boy Productions returned this year to provide entertainment with a DJ to command the modern, edgy vibe of the event. As dinners were finished, a live auction was held for guests to bid on the piece Moody had created before their eyes. Special thanks to other event sponsors including RSVP Events, Gulf Power, The One- Destin, Flip Flop Real Estate and Marsha Babe of ERA Real Estate Niceville. Click here to Watch the Highlight Video from Palate & Palette!